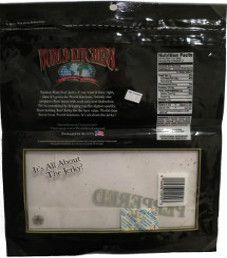 Back in 2012, while visiting Las Vegas, Nevada, I purchased a 3/4 pound/12 ounce/360 gram bag of World Kitchens beef jerky at an ABC Store. This review will focus on World Kitchens peppered flavor. Ingredients: Sliced Beef, Brown Sugar, Water, Salt, Papaya Juice, Black Pepper, Vinegar, Garlic Powder, Natural Smoke Flavor, Sodium Nitrite, Monosodium Glutamate, Citric Acid. The liquid marinade is comprised of water, papaya juice, and healthy vinegar. Papaya is a very healthy fruit that contains an enzyme named papain, which acts as a natural meat tenderizer. The sugar level is somewhat high at 6 grams of sugar per 28 grams of jerky. Our preference is 3 grams of sugar or under. The salt level is very high at 580mg of salt per 28 grams of jerky. Our preference is 350mg of salt or less. This jerky does use unhealthy sodium nitrite as the main preservative, apart from salt. Citric acid also acts as a preservative to a lesser degree, where the quality of citric acid can vary widely. Disappointingly, this jerky uses MSG outright. These strips were small, to medium sized, and sliced to a medium thickness. They had a good, fairly dry texture, which was relatively easy to chew. There was nothing that really quite stood out with this flavor. 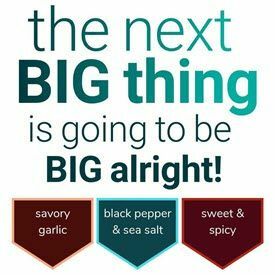 Being a black pepper based flavor, the peppery taste was at about a mild level. Overall, this jerky did have a decent flavor. I paid an overpriced $15.99 for this 12 ounce/340 gram bag. That is what I get for buying something from the Las Vegas strip. Much more commonly, this jerky used to sell for $9.99. That works out to 83 cents an ounce, which is easily the cheapest price for a bag of jerky reviewed on this site so far. While not having the best ingredient list out there, this was an average deal considering how incredibly cheap the price was. 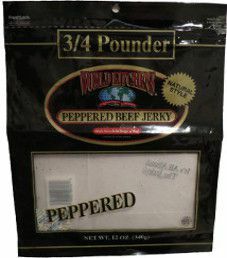 This bag is about the biggest jerky bag you will find for sale. Thankfully, the bag was resealable being 12 ounces/360 grams, although it does say on the bag to refrigerate after opening, or use within three days. Everything is imprinted directly on the bag, with no affixed labels. The World Kitchens logo seems fitting, a picture of the globe. Their slogans are “Quality Meats” and “It’s All About The Jerky!”. The bag identifies the jerky as being “Natural Style”, which is explained further on the back of the bag. Every single bag category is covered with this bag. Overall, a professional design, but with no fancy graphics, or noteworthy originality. I purchased my first bag of World Kitchens Jerky yesterday at Target. Not bad for the price. Taste isn’t bad either. I realized later that the meat is a blended pork and beef product. Whats this mean? I wasn’t sure if that meant that there are beef chunks and pork chucks mixed into my bag. As I look, they seem all the same. So, it’s literally blended? I have to assume they’re not actual strips from one particular animal. Or even two. But both? Really? Does this mean mixed(blender) and formed then cut?? Like a McRib sandwich? Cast molded?? Kinda unappealing, if you ask me. I read the package again for more info. Distributed in Iowa. Ok. Packaged in U.S. Ok. All good. I read the name again. World Kitchens. Hmm? World? Begs the question; wheres the meat from?! Somewhere not here?? Then where? Ah ha! I will go to the website. Nope. Its isn’t found. No web site?! Weird. Product is all over Amazon. Not necessarily a great thing. But what the hell am I eating!!! Beef? Pork? A cat or a dog? Human?! Why aren’t they more transparent? Hi, I was wondering where’d you find the info on distribution and manufacturing? Hi Eugene, I got the distribution and manufacturing information from the Customer Relations department at World Kitchen’s Premium Meat Snacks. I won’t buy it again with no ability to know for sure where the meat is coming from. MSG is a big, big deciding factor in this decision as well. too bad it was affordable no wonder…too many questions about quality.